"Of the 32 previous occasions of a side winning the first leg of a Champions League tie 1-0 at home, 22 went on to progress (69%), suggesting Spurs are a little overpriced at 2.46 in the To Qualify market." Manchester City bounced back to winning ways with a dominant 3-1 victory at Crystal Palace on Sunday. Raheem Sterling scored twice at Selhurst Park to inspire the Citizens to a ninth straight Premier League success before substitute Gabriel Jesus confirmed the result in the dying embers of the encounter. The returning Kevin De Bruyne also sparkled. Having looked ordinary edging past Brighton in the FA Cup semi-final, as well as in the first leg of their Champions League tie at Tottenham, Pep Guardiola's side returned to their majestic best in the capital. City were unfortunate only to be one-goal ahead after the interval following 45 minutes of relentless pressure in the final-third. Guardiola made four changes to his starting XI with Benjamin Mendy making his first league start since November and Bernardo Silva appearing off the bench. Fernandinho didn't travel with the squad and is rated doubtful for Wednesday night despite the club suggesting he's only suffering from a short-term knock. De Bruyne and Sane will hope to keep their places. A much-changed Tottenham team cruised past relegated Huddersfield on Saturday with Lucas Moura hitting the headlines with a hat-trick at the Tottenham Hotspur Stadium. Spurs moved into third in the Premier League with an impressive effort that also included a rare goal from Victor Wanyama, who opened the scoring midway through the first half. 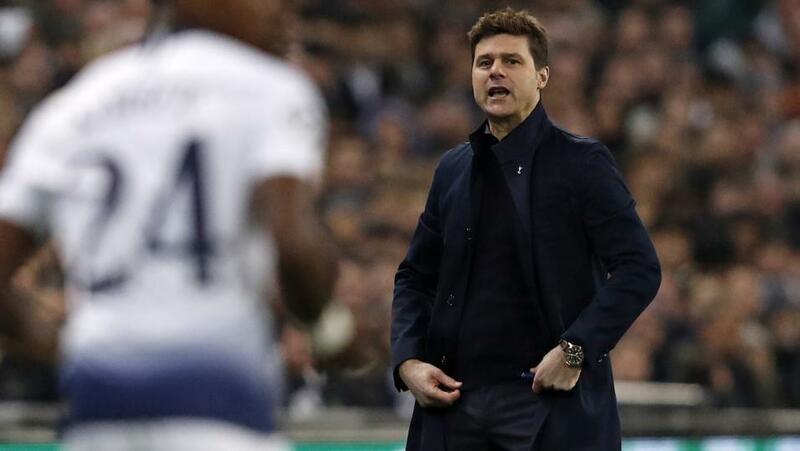 With one eye firmly on this Champions League quarter-final second leg, head coach Mauricio Pochettino made seven changes to his starting XI. Moura, Fernando Llorente and Christian Eriksen formed a new-look front three and the trio were hugely influential in the one-sided contest - the latter pair also hit the woodwork in a dominant display. Leading goalscorer Harry Kane is a confirmed absentee for Tottenham, although Dele Alli is expected to feature despite breaking his hand in the first fixture with City. Elsewhere, Harry Winks is hopeful of being available again and the likes of Son Heung-Min, Toby Alderweireld and Danny Rose will all be recalled. Serge Aurier, Eric Dier and Erik Lamela remain sidelined. Manchester City have lost just once in their last eight encounters with Tottenham at The Etihad across all competitions (W6-D1-L1) and the Citizens have also enjoyed the upper hand in the majority of recent meetings, taking top honours in 11 of their last 17 duels with Spurs (W11-D4-L5). The hosts are rated just a [1.32] chance to enhance that record. Pep Guardiola's group have tabled 16 triumphs from 17 home Premier League matches this season, with 13 victories by two goals or more. City have also registered eight wins from nine when welcoming Big Six opposition since the start of last season, collecting maximum points by a margin of at least two goals in six of those nine outings. Tottenham [11.00] have returned just W2-D3-L9 at Big Six teams since 2016/17, leaking at least twice on nine occasions. However, of the 32 previous occasions of a side winning the first leg of a two-legged Champions League tie 1-0 at home, 22 went on to progress (69%), suggesting Spurs are a little overpriced at [2.46] in the To Qualify market this midweek. Tottenham came into the first leg fixture having recorded a solitary shutout in nine showdowns with Big Six opposition in the Premier League this season. Indeed, Spurs have leaked at least two goals at Liverpool, Arsenal and Chelsea already this term and are likely to come under plenty of pressure from the division's most fearsome forwardline. Goals backers have seen Over 2.5 Goals [1.51] pay-out in eight of Manchester City's nine contests at The Etihad against Big Six visitors in domestic matters since the beginning of 2017/18 and a repeat is expected here. But a much more attractive option is to back Both Teams To Score at [1.78] quotes. Spurs have scored in six of their last seven trips to the Big Six and should relish the opportunity to counter-attack with a tie-changing away goal potentially on offer. Meanwhile, City have seen six of the last nine Premier League encounters at The Etihad with Big Six sides pay-out for BTTS hunters.